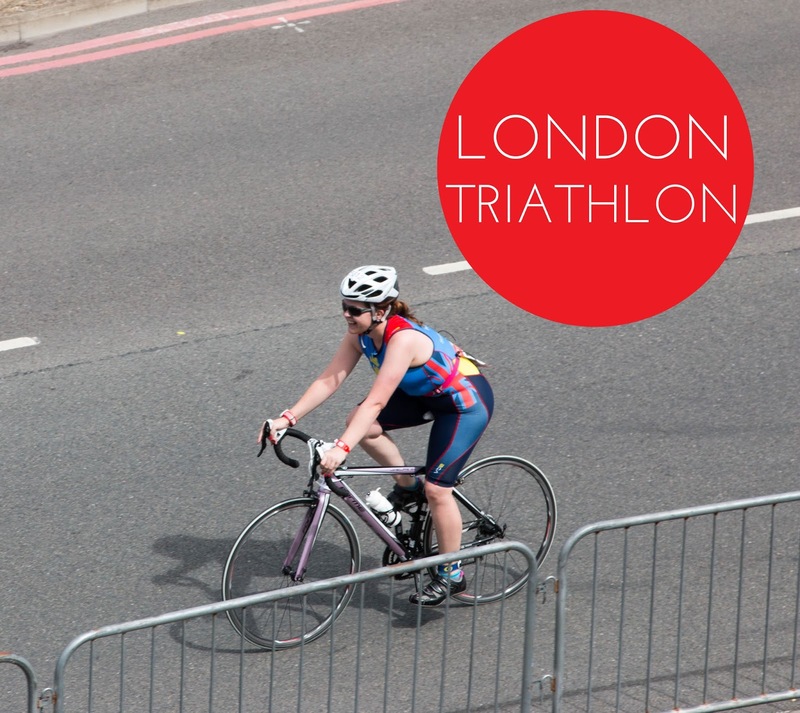 I was in two minds about whether to enter the London Triathlon, as I’ve heard mixed feedback about the event. However, the decision was made for me, as I was lucky enough to win an entry with TRI247. 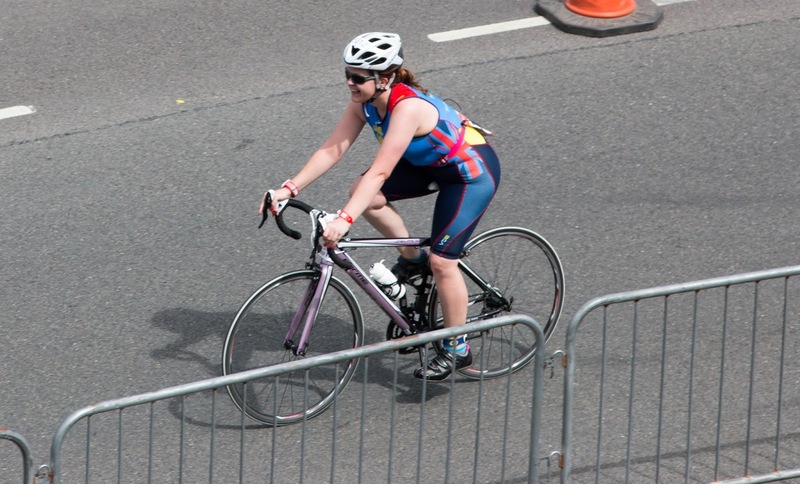 I’m grateful that I did, as this was one of my most enjoyable triathlons to date! 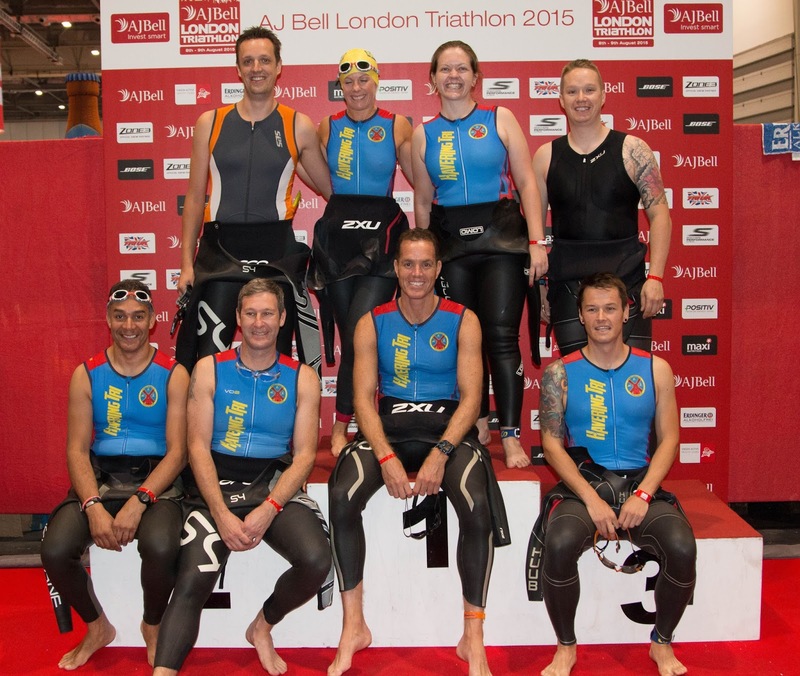 Ten of my clubmates from Havering Tri were also doing the event and we had all been allocated to the 12pm Olympic wave on Sunday. Glen had also managed to get a last minute entry to the triathlon, so it turned out to be the perfect way to celebrate 13 years together. 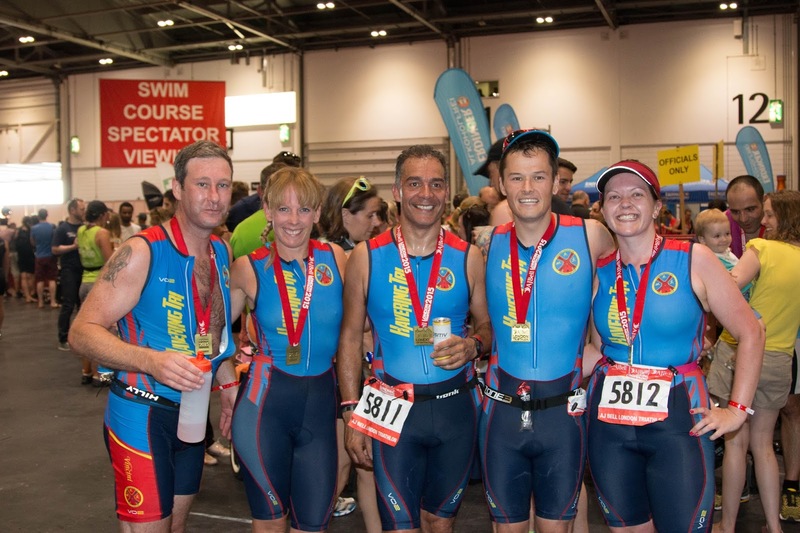 We arrived at the ExCel Centre with plenty of time to lay out our kit, familiarise ourselves with the route in and get a team photo on the podium! We then joined over 400 people in the swim assembly area for the briefing. The nerves were starting to kick in and the warm weather was making me sweaty in my wetsuit- I couldn’t wait to get in the water! I jumped into the water and positioned myself to the left and at the front of the pack, as we waited for the klaxon to sound. A few people had told me that the water tastes horrible in the Royal Victoria Dock, they were right! The taste of salt and diesel was the first thing I noticed as I put my head into the water. The swim was one rectangular lap taking us almost as far as the Connaught Bridge, then back round and straight back past an inflatable red pig. The first buoys seemed so far away, we could see just a glimpse of them in the distance. I got into a rhythm quickly and the swim start was not as chaotic as I had anticipated, there was actually plenty of space around me in the water. I love the history of this area of London and I’m fascinated by the derelict buildings which sit alongside the new developments of the docklands. I could see the Millenium Mills building as I swam and thought about what the building used to be used for in the 1900s. Maybe a strange thing to think about while you a swimming in a triathlon, but it works for me! The swim did seem incredibly long, according to my Garmin it was actually 1770m rather than 1500m. I was a bit disappointed with my swim time, but it’s actually not too bad if the swim was indeed longer than Olympic distance. The unusual thing about this event is that the transition is indoors, within the ExCel Centre, so you have to take off your wetsuit outside and carry it in a sack. Volunteers handed us the bags as we stripped off in the gangway. Feeling a bit dazed and confused after the swim, I struggled a bit with my wetsuit. I could hear spectators calling my name, but I couldn’t see where they were. We then had to go up a flight of stairs into the building- it was harsh after the swim! Lee was next to me and commented that he felt like Santa Claus carrying his sack! The thing that I was most nervous about was the transition. The area is absolutely huge- the largest in the world! I was concerned that I wouldn’t be able to find my bike, but I needn’t have worried as it was straightforward. We were racked on Row L (L for Lucy) and the zebra print and Minions towels caught my eye! As soon as I mounted the bike, it was straight down a ramp and out onto the course. Brett went flying past me and wished me good luck. The bike course was two laps on the closed roads of the Docklands, taking us through a more technical section in Canary Wharf. 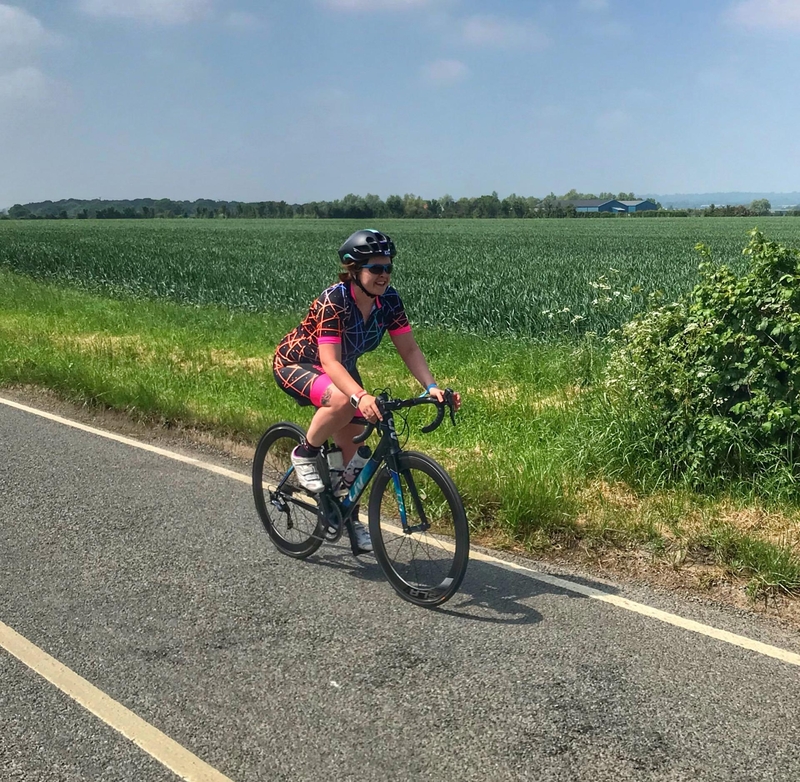 The roads were quite undulating with bridges and roundabouts along the route. Canary Wharf and the Shard glistened in the sunlight and it felt quite magical to be cycling along dual carriageways which would usually be gridlocked with London traffic. I loved going through the Limehouse Link tunnel- it was downhill all the way and the shade and cool air provided welcome relief from the sun. I’m not able to drink on the bike, as my water bottles are wedged in so tight on my small frame it’s impossible to take them out and put them back in while I’m moving. I knew I’d need to stop at some point to take a drink as I’d soon get dehydrated in the hot weather. I actually had to stop three times which isn’t ideal. I pulled over when I was on a flat section of road, gulped down some water and quickly got going again. I definitely need to work out a solution for hydrating on the bike. Our support team were out in force as I passed by the ExCel, I heard Lisa, Nikki, Richard and Glen’s parents cheering me on. There were also a few members from local running club Dagenham 88 Runners giving cheers of “Go Havering” every time they saw me. Two laps complete and it was back up the ramp into the ExCel. Bike racked and helmet exchanged for a visor then it was back out for the run. The run course was three laps alongside the dock with the planes landing at City Airport just across the water. We looped through the Excel building with each lap, which meant passing the finish line but not being able to cross it! I enjoyed the run as I got to see all of my Havering Tri friends out on the course, those who were struggling and those who were storming along. Our supporters were in position by the DJ, so their cheers along with the music gave a huge boost on each lap. Glen passed me on his final lap as I was just finishing my first. I knew he was on for a fantastic time and I got to see him cross the finish line in 2:26:40! The best part of the course was the sprinklers spraying cool water- lovely and refreshing in the afternoon sun. The worst part was a terrible smell at a certain point- like rotting rubbish! I felt blisters forming on my heel during the run- I never usually get blisters- time these old trainers were retired I think! My sunglasses were also bothering me… I took them off, put them back on, took them off… I felt like just throwing them away! Finally my last lap was complete and I went up the ramp into the ExCel onto the red carpet for the finishing straight. 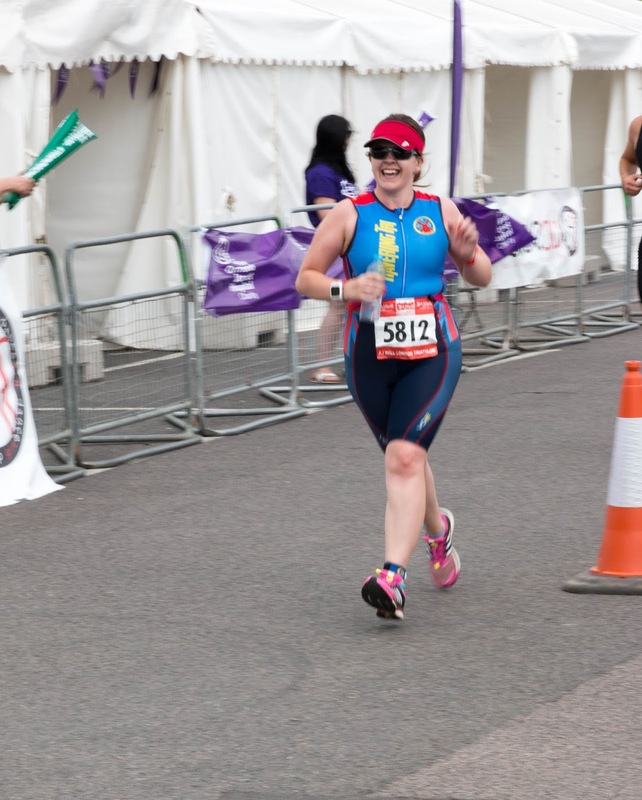 I jumped over the finishing line with a little air punch and soon I was surrounded by friends and supporters from Havering Tri. I finished in 3:03:53- my slowest Olympic distance to date, but definitely my most enjoyable. What makes a great training location?